A book about finding your creative power. A quarter century ago, as a blocked and frustrated writer, I stumbled on a method that transformed my process and put me on the road to becoming a freelance writer . . . and later, an artist, presenter, and creative adventurer.My insights led me to design “Wildfire Writing,” a class which for the past 16 years has helped writers and artists find boldness and freedom. I’ve revealed these principles in Burn Wild: A Writer’s Guide to Creative Breakthrough. 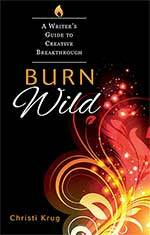 Burn Wild: A Writer’s Guide to Creative Breakthrough is rich with inspiration, exercises, and a novel approach to your creativity. Available at Powell’s, Amazon, and other booksellers, in paperback and e-book. 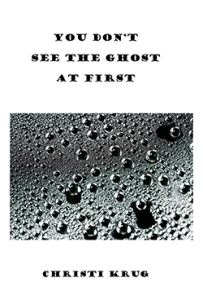 You Don’t See the Ghost at First is my chapbook of autobiographical poems and flash prose poems. You can get a copy the old fashioned way by sending an email to christikrug@yahoo.com. 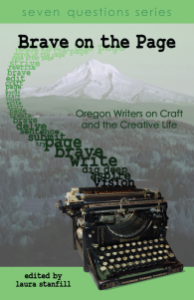 Brave on the Page is a delightful Portland-centric collection of essays and interviews about the writing process. I’m proud to be a part of this award-winning book available from Forest Avenue Press. Christi Krug’s voice is wonderful in these pages and it is easy to enjoy her intimate and conversational style throughout the book. She says early on in the book: “Read the chapters in any order. Write in this book. And I took her suggestion seriously. . .
What I love about this book is how you can turn to any section and be both inspired to write and given a specific writing “spark.” This is a “feel good” book, but it’s also a book that will get you to write. What’s not to love about that? I will use this book when inspiring other writers that I mentor. As a writing-book junkie, I was thrilled to receive a review copy of Christi Krug’s Burn Wild. Books like Steven King’s On Writing and Anne Lamott’s Bird by Bird are full of amazing insight and advice, but none of that will do a writer a lick of good until she actually sits down and writes. If you want to write but are daunted by getting started, you will find help here. This is a book that reminds you writing is creative and should be fun. It encourages you to make mud pies and gives you tools for overcoming your fear of getting your hands dirty. If you, like me, enjoy a dry, academic style, this book may strike you as a bit sparkly-rainbow.It is unapologetically a “feel-good” book, as cheerfully acknowledged by the author in the introduction. When I took Christi Krug’s Wildfire Writing class, it felt hokey and uncomfortable at first, but no matter–I was inspired anyway. Classroom exercises (which have become “sparks” in the book) inspired short pieces which I later grew brave enough to submit and see published. Many of the tiny forty-three chapters in the book are focused on circumventing one’s inner critic in order to let the creative self loose. Throughout the book are “sparks,” (writing prompts or other activities) which will help reinforce the ideas. Some may grab you, some may seem less useful. But give them a try. This is a well-written book, but you won’t know how effective it is until you put it into practice. In addition to the suggested exercises, the chapters contain gleanings from many classic writing books and are enriched by personal anecdotes from the writer’s life and the writing lives of her friends and students. This is a wide-ranging book. The chapter “Fired Up for the Journey” is particularly helpful for new writers. It explains the different stages of the creative process and what we should focus on in each stage. It’s very simple, but reduces confusion and frustration for the writer who’s never taken a project from start to finish before. Other chapters will stand out to you (or not) according to your personality and writing experience. While a few chapters seemed vague to me, or addressed topics I didn’t connect with, I found most of the book to be useful and thought-provoking. I especially liked the warning to beware the creeper of ambition (guilty), the admonition that “You have no idea how good you are until you give the work your best strength,” and the practical steps for dealing with my personal writing nemesis, procrastination. Burn Wild is the cheerleader I need when I’m cynical or stuck or uninspired. Best of all, Burn Wild is grounded in the big picture, and reminds us that the important thing is who we are, not what we produce. “Instead of being famous, as I once thought I needed to be,” Krug writes, “I have found a sphere of influence where I can help and encourage.” That’s the kind of writer, and person, I want to be. I am an “adult survivor of childhood writing perfectionism.” What’s that mean? It means that, somehow, some way, while growing up, the need to be right and proper and perfect, “a good kid,” wrecked my ability to partake in the fun, creative process that good writing requires. I am here to tell you that Christi Krug, the author of this miraculous book, cured my writing perfectionism. This book did for me what years of therapy, some hypnotism, plenty of psychic flogging, and other writing books and writing coaches didn’t do: help me enjoy the writing process again. It changed my professional life. Instead of losing hours of my life stuck in “perfectionistic procrastination” I now daily enjoy the process of writing using Christi’s wildfire writing methods. This book absolutely, unequivocally, changed how I view my writing -and myself and my life. I didn’t know those three were entwined so much until this book spelled it out for me. I owe all that to Christi and Burn Wild. “This is a book about living and writing. It offers the courage to do both more creatively,” says the author, and she’s right. Burn Wild is a beautiful book, with flowing prose and enticing ideas, all told in a natural tone of voice that never falters or palls. Fascinating quotes start the chapters. Carefully crafted sparks encourage the creative mind. And wise advice uplifts the soul from its beaten-down, I’m-no-good-at-this conventional misery. Forget left brain, right brain. What about flesh and spirit, creative and critical, “Dr. Codger and the Dream Kid”–a wonderful concept that’s followed by a clear simple table elucidating the magical differences. The author refers to matches and sparks, wild fire perhaps that first has to be lit and then protected. Then she offers her own shimmering sparks, simple reminders and questions to light your fire. Oh how easily I relate to the mom, twenty-some years ago, raising toddlers and juggling priorities. How well I remember that incessant guilt about time taken for myself. And how truly I need to be reminded, I have a right to write. Of course, I do write now. I write as if it’s my chocolate treat at the end of a busy day. I look forward to writing but still find it clouded in guilt–like that chocolate treat, imagining it has to somehow turn out badly for me. I tangle myself in Codgerly demands while my Dream Kid wants to play. This book will be perfect if you wish you had time to write, or paint, or draw ccartoons, or whatever floats your boat. But it offers wonderful inspiration even if you have time and do enjoy those creative arts. It’s a reminder of passion, a call to play, and a welcome warmth of fire with the excitement of the chance to dance. Thank you Christi Krug. I may still never keep a journal, but I love this book! Disclosure: I was given a free ecopy of this by the author who rightly thought I might enjoy it.